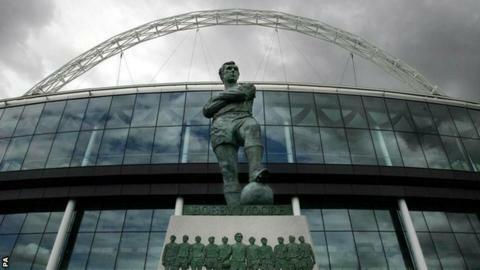 The Football Association has submitted a bid for Wembley to host either the Euro 2020 semi-finals and final, or some group matches. The English bid has been submitted to Uefa ahead of the midnight deadline, while Wales and Scotland have also bid for group matches. It was announced in December that the European Championship would be held in multiple cities across Europe. Uefa will announce the 13 host cities at a ceremony on 19 September. FA general secretary Alex Horne said: "We are bidding for either of the two packages available and, with our recent experience of hosting two Uefa Champions League finals in the last four years, we believe that Wembley Stadium and London represent a strong bid for Uefa to consider to mark the tournament's 60th anniversary. "We recognise Uefa is considering many strong bids from a number of candidate cities and we welcome the opportunity to put forward our bid." Scottish Football Association chief Stewart Regan said earlier in the week that it was "highly unlikely" there would be four winning bids from the United Kingdom and Republic of Ireland, which will also submit its bid on Friday. Both Scotland and Wales have applied to host group stages matches and a last-16 tie for the 24-team tournament. A number of the 32 countries who initially registered an interest have dropped out of the running, including Portugal, Poland and the Czech Republic.